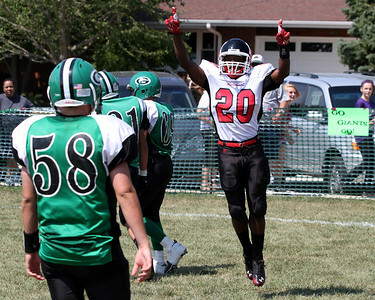 Alden-Hebron faced Mooseheart Saturday, August 25, 2012 at Alden-Hebron High School in Hebron. Mooseheart defeated Alden-Hebron 55-14. Mike Greene - mgreene@shawmedia.com Alden Hebron's Chip McKay comes up against a defender while retuning the opening kickoff in the first quarter against Mooseheart Saturday, August 25, 2012 at Alden-Hebron High School in Hebron. Mooseheart defeated Alden-Hebron 55-14. 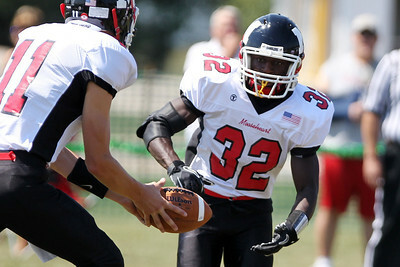 Mike Greene - mgreene@shawmedia.com Mooseheart's Sahr Mahoney prepares to take a handoff during the first quarter of a game against Alden Hebron Saturday, August 25, 2012 at Alden-Hebron High School in Hebron. Mooseheart defeated Alden-Hebron 55-14. 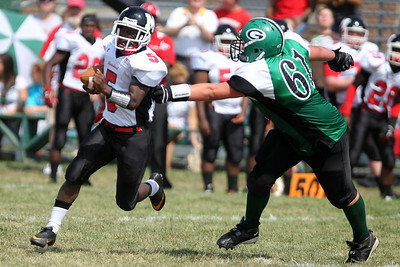 Mike Greene - mgreene@shawmedia.com Alden Hebron's Nick Beck (left) attempts to track down Mooseheart running back Oumaru Abdulahi during the first quarter of a game Saturday, August 25, 2012 at Alden-Hebron High School in Hebron. 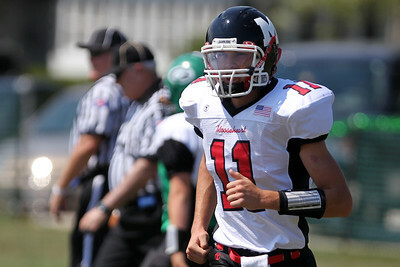 Mooseheart defeated Alden-Hebron 55-14. 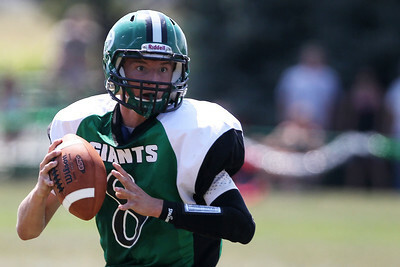 Mike Greene - mgreene@shawmedia.com Alden Hebron quarterback Bryce Lalor looks down field for an open receiver during the second quarter of a game against Mooseheart Saturday, August 25, 2012 at Alden-Hebron High School in Hebron. Mooseheart defeated Alden-Hebron 55-14. Mike Greene - mgreene@shawmedia.com Alden Hebron running back Nick Beck is swarmed by a group of Mooseheart defenders during the second quarter of a game Saturday, August 25, 2012 at Alden-Hebron High School in Hebron. Mooseheart defeated Alden-Hebron 55-14. 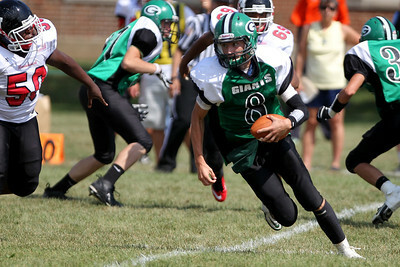 Mike Greene - mgreene@shawmedia.com Mooseheart quarterback Jonathon Hart jogs off the field after his team scores a touchdown in the first quarter of a game against Alden Hebron Saturday, August 25, 2012 at Alden-Hebron High School in Hebron. Mooseheart defeated Alden-Hebron 55-14. Mike Greene - mgreene@shawmedia.com Alden Hebron wide receiver Chip McKay holds onto the ball after being hit by a Mooseheart defender during the second quarter of a game Saturday, August 25, 2012 at Alden-Hebron High School in Hebron. Mooseheart defeated Alden-Hebron 55-14. 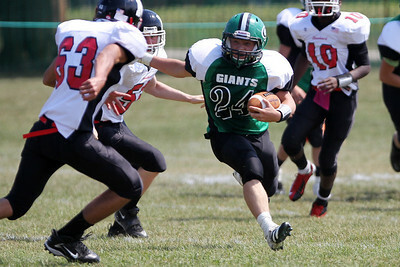 Mike Greene - mgreene@shawmedia.com Alden Hebron running back Nick Beck comes up against a Mooseheart defender while rushing the ball during the second quarter of a game against Saturday, August 25, 2012 at Alden-Hebron High School in Hebron. Mooseheart defeated Alden-Hebron 55-14. 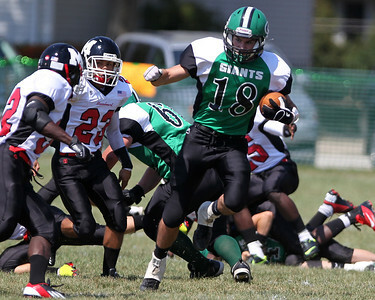 Mike Greene - mgreene@shawmedia.com Mooseheart's Peter Mator (left) runs by the outstretched arms of Alden-Hebron lineman Trent Redlin during the second quarter of a game Saturday, August 25, 2012 at Alden-Hebron High School in Hebron. Mooseheart defeated Alden-Hebron 55-14. 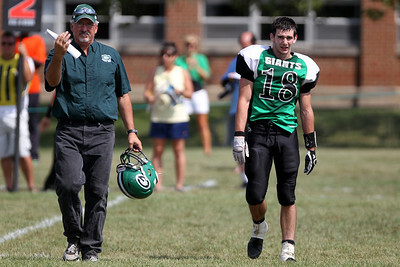 Mike Greene - mgreene@shawmedia.com Alden Hebron head coach John Lalor signals to the sideline after an injury to tight end Chip McKay during a game against Mooseheart Saturday, August 25, 2012 at Alden-Hebron High School in Hebron. Mooseheart defeated Alden-Hebron 55-14. 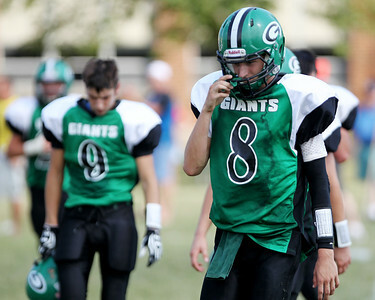 Mike Greene - mgreene@shawmedia.com Alden Hebron quarterback Bryce Lalor walks off the field at halftime during a game against Mooseheart Saturday, August 25, 2012 at Alden-Hebron High School in Hebron. Mooseheart defeated Alden-Hebron 55-14. 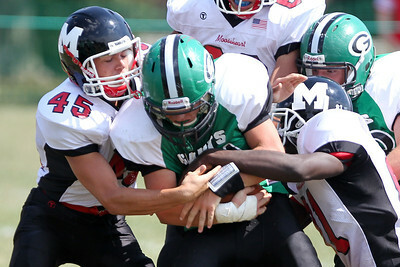 Mike Greene - mgreene@shawmedia.com Alden Hebron quarterback Bryce Lalor looks for running space while scrambling in the second quarter of a game against Mooseheart Saturday, August 25, 2012 at Alden-Hebron High School in Hebron. Mooseheart defeated Alden-Hebron 55-14. 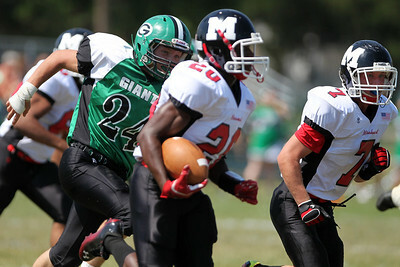 Mike Greene - mgreene@shawmedia.com Mooseheart running back Oumaru Abdulahi (left) pushes away Alden Hebron defender Nick Beck during the first quarter of a game Saturday, August 25, 2012 at Alden-Hebron High School in Hebron. Mooseheart defeated Alden-Hebron 55-14. 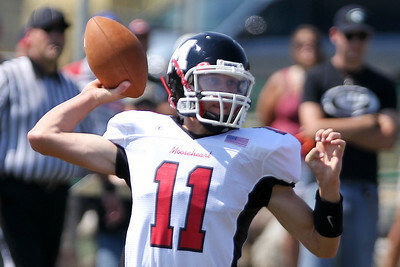 Mike Greene - mgreene@shawmedia.com Mooseheart quarterback Jonathon Hart winds to pass during the first quarter of a game against Alden-Hebron Saturday, August 25, 2012 at Alden-Hebron High School in Hebron. Mooseheart defeated Alden-Hebron 55-14. 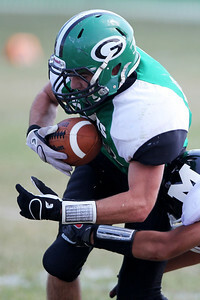 Mike Greene - mgreene@shawmedia.com Alden Hebron's Mooseheart's during a game against Mooseheart Alden Hebron Saturday, August 25, 2012 at Alden-Hebron High School in Hebron. Mooseheart defeated Alden-Hebron 55-14. Mike Greene - mgreene@shawmedia.com Alden Hebron linebacker Chip McKay (left) attempts to pull down Mooseheart running back Loe Feemorlu during the second quarter of a game Saturday, August 25, 2012 at Alden-Hebron High School in Hebron. Mooseheart defeated Alden-Hebron 55-14. 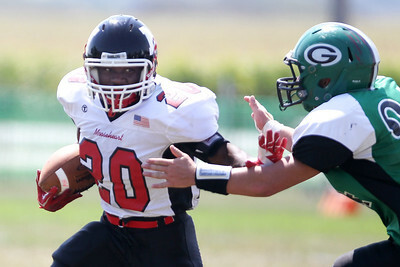 Mooseheart running back Oumaru Abdulahi (left) pushes away Alden Hebron defender Nick Beck during the first quarter of a game Saturday, August 25, 2012 at Alden-Hebron High School in Hebron. Mooseheart defeated Alden-Hebron 55-14.